This Friday, get ready as Team Aldous presents Tortuga x House of Griddle HOT WIngs Challenge. With beats by Ryle Alcantara, you'll surely groove to outstanding music all night long. The event is also hosted by the very entertaining Dee Jae Pa'este with special participation from Jimlong's Chili. Joining me as media partners for this event are my #TeamAldous stablemates Nikki, Eva, Crystal and Rebecca. 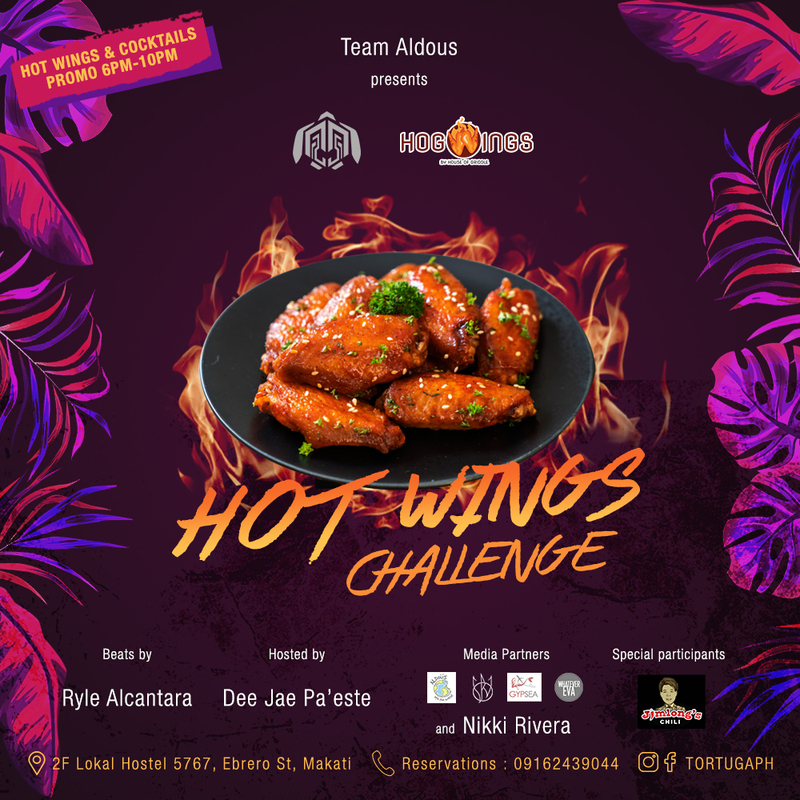 How is the Hot Wings Challenge played? You'll eat 6 pieces of Carolina flavored wings and you must consume them under 2 minutes without drinking anything. If you succeed, you'll get it for free. If you lose, you don't lose much anyway since you'll just pay P169. That's not all! From 6 to 10 PM, enjoy the cocktail + wings promo for only P320. You have the Sneaky Tiki + Honey Sriracha, Guava Lava + Garlic Parmean, Cocomo + Korean Soy and Hisponiola + Hickory Barbeque combos. If beer is your thing, go for the Bucket of Beer + Salted Egg for P495. For table reservations, call or text 09162439044.